Here is my Tok Pisin page. Enjoy this fantastic language! No smoking sign in Kavieng. So, take your time, and you’ll learn a few things about a wonderful language. 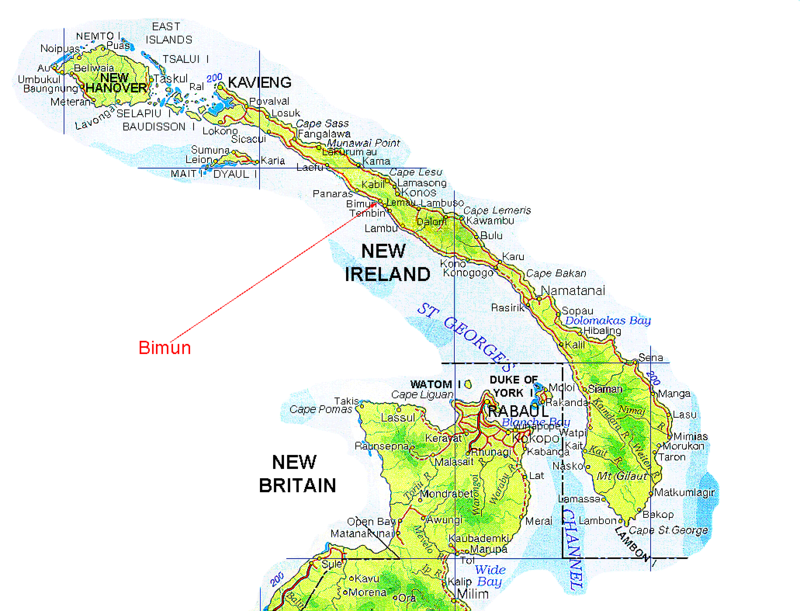 Tok Pisin is an English-lexicon pidgin/creole language spoken in Papua New Guinea. It is one of the three official languages of this nation with nearly 800 languages. (The other two official languages are English and Hiri Motu.) Although around 80% of the lexicon is derived from English, the syntax is predominantly Austronesian. The basic word order is SVO. The Austronesian substratum in Tok Pisin appears on several levels in the syntax. A few traits of interest are described in the following passages. Tok Pisin discriminates between e.g. mipela (“we”, exluding the addressee) and yumi (“we”, including the addressee). Tok Pisin makes use of a predicate marker i, which precedes the predicate in cases where the subject contains some kind of third-person element. (This means that it does not appear after some subject pronouns.) Although it is sometimes seen written together with the predicate verb (e.g. in the weekly newspaper Wantok), and sometimes with the preceding pronoun (ditto), it definitely exists in its own right, and marks the entire predicate. For example, in negated predicates, the negation no goes between the predicate marker and the predicate verb. All verbs of movement or direction are serial verb constructions in Tok Pisin, specifying whether the direction implied is towards (i kam) or away from (i go) the speaker. Tok Pisin encodes aspect (continuous and completed) and tense (mainly future) by means of free-standing markers with a relatively free distribution. The continuous markers are i stap or wok long and the completive marker is pinis. The future marker is bai, which is placed either in sentence-initial or predicate-initial position. This means that the subject pronoun is (often) placed in between the future marker and the predicate verb. Although Tok Pisin, like pidgin and creole languages in general, lacks inflectional morphology, reduplicative morphology is very productive, and serves many different linguistic purposes. For more information on Tok Pisin, have a look at Eva Lindström’s homepage. During my last visit, children on both coasts were singing this funny little ditty while clapping their hands in a way I never quite managed to learn myself. The lyrics are not “pure” Tok Pisin, but a mixture of English and Tok Pisin, but it is so adorable, so I realised I wanted to preserve it for posterity, so one evening I recorded Tine and Damaris on Eva’s porch in Bimun, New Ireland. In the table below you find two files to download. 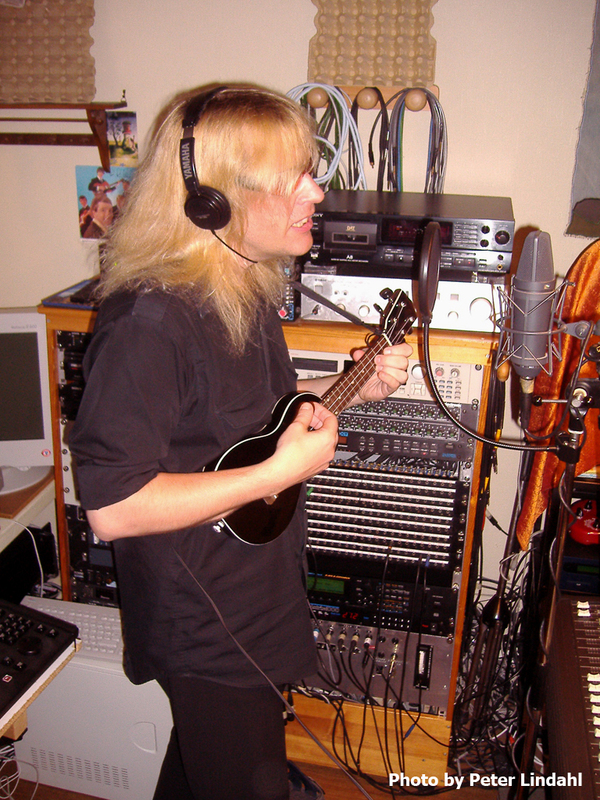 The long one covers a fair share of the recording session, including several alternative takes. You can hear both me and Eva talk with the performers Tine and Damaris. (Grace is listening, with her back towards to camera.) 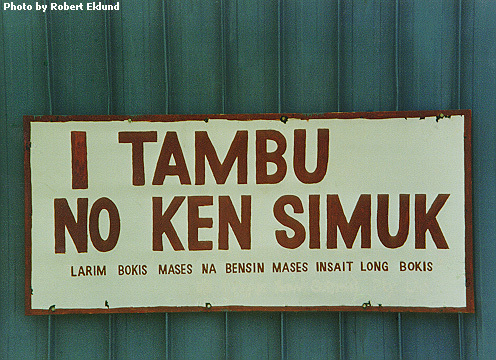 You can also hear the word “temaieng”, which means “thank you” in Kuot. For years I wondered what the part about the “swollen face” meant, until Jael Girard (who spent part of her young years in PNG) kindly informed that that is what happens to you when you get home again and get a beating (face slaps) from having run off without permission. Here is a studio recording of the Tok Pisin hymn Yumi litimapin. 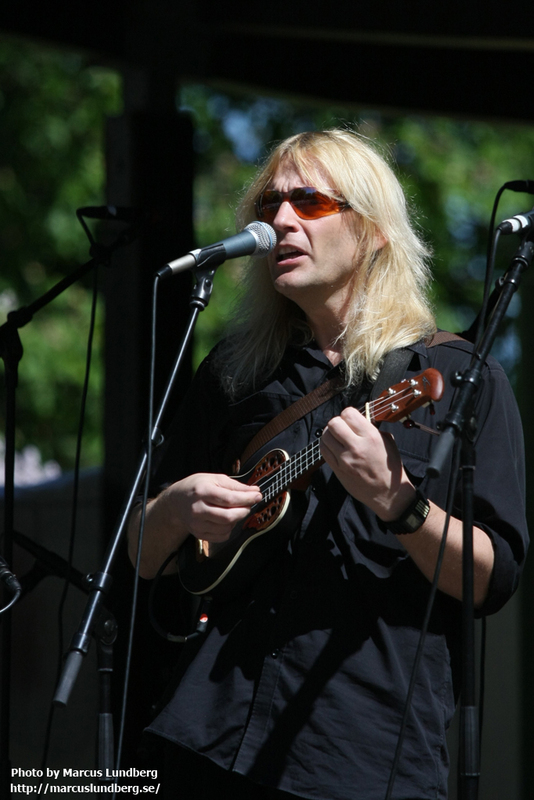 I performed it at the Swedish Ukulele Festival in Göteborg (before an audience of 3000 people) since I deemed it appropriate given that the ukulele is a common instrument in Papua New Guinea. 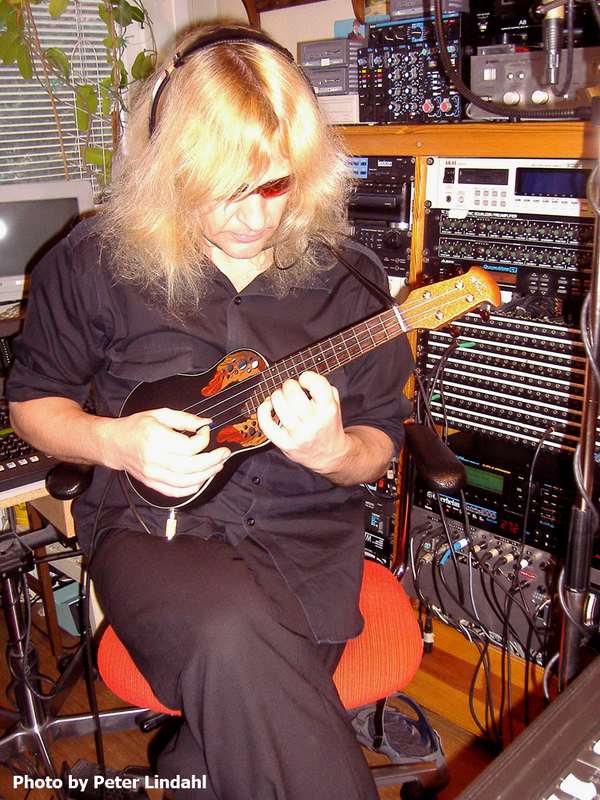 A week after the festival I recorded it in the In The Labyrinth studio. Below are pictures from the concert and the studio session. 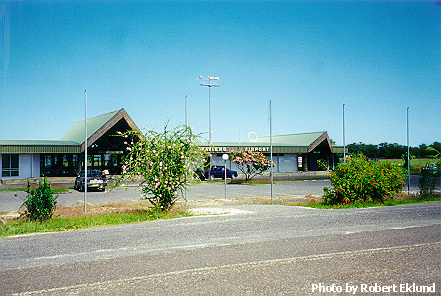 During my last visit – December 1999 to February 2000 – I recorded 39 speakers as they were booking or confirming flight at the Air Niugini sales office, Kavieng Airport. 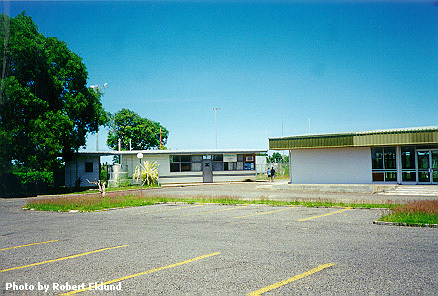 Air Niugini sales office, Kavieng Airport. “NOTICE. Chewing and spitting of betelnut is prohibited in the airport area”. 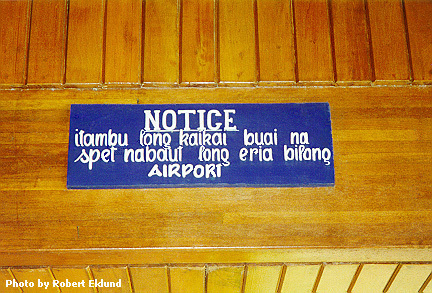 Sign at Kavieng Airport. 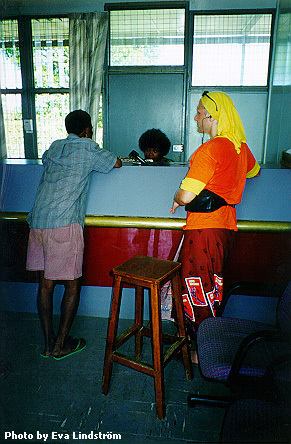 Me recording customer at Air Niugini sales office, Kavieng Airport, January, 2000. The data have been used/analysed in three articles so far. The numbering is the same as the one found on the Publications Page. Prolongations: A dark horse in the disfluency stable. Proceedings of DiSS '01 Disfluency in Spontaneous Speech, ISCA Tutorial and Research Workshop, University of Edinburgh, August 29–31, 2001, pp. 5–8. Crosslinguistic Disfluency Modeling: A Comparative Analysis of Swedish and Tok Pisin Human–Human ATIS Dialogues. Proceedings of ICSLP’00, Beijing, 16–20 October, vol. 2, pp. 991–994. Wanpela deitabeis long Tok Pisin bilong baim tiket bilong balus. (An ATIS database in Tok Pisin.) Methodological observations with regard to the collection of human–human data. Proc. 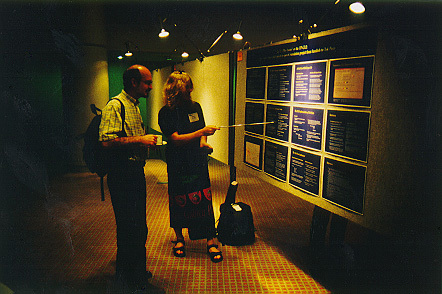 Fonetik 2000, The Swedish Phonetics Conference, May 24–26 2000, University of Skövde, pp. 49–52. One of the customers was Dicks Thomas, co-author of the book I used to study Tok Pisin prior to my first visit, i.e., A New Course in Tok Pisin, by Tom Dutton and Dicks Thomas. Dicks kindly gave me the permission to put a sample from his conversation with Loris (who already had given me the permission to use the sound files, of course). Dicks can be contacted by email. Download a one minute excerpt from the table below. Thanks go to Eva Lindström for transcription assistance, and to Dicks for checking the accuracy of the final transcription and translation. Travel agent Loris and customer Dicks Thomas. Ahm, wanpela sit i stap lo fotint. Hmm, there is a seat on the 14th. D: Oke, putim mi lo dispela. OK, put me on that one. ... mi no bin yusim from Lae kam long hia. ... I haven’t used it from Lae to here. L: OK. Em i bilong go long we? Lae o Mosbi? OK. What’s its destination? 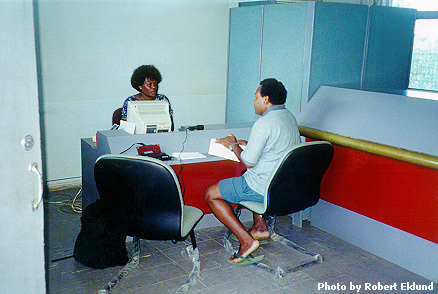 Lae or Port Moresby? D: No, long hia i go long Mosbi. No, from here to Port Moresby. ... i kam bilong Kavieng tasol mi bin wokabaut long narapela rot. ... to Kavieng, but I’ve come here by another way. D: Iya. Bai yumi senisim, tasol. Yeah, we’ll just change it. L: So yu holim tiket i stap? Tasol em i...? ... and they can prepare it. Ating apinun o tumora bai mi kam kisim. Maybe this afternoon or tomorrow I’ll come and get it. L: OK, bai mi givim yu kopi long buking. Yu weit. OK. I’ll give you a copy of the reservation. Just a minute. 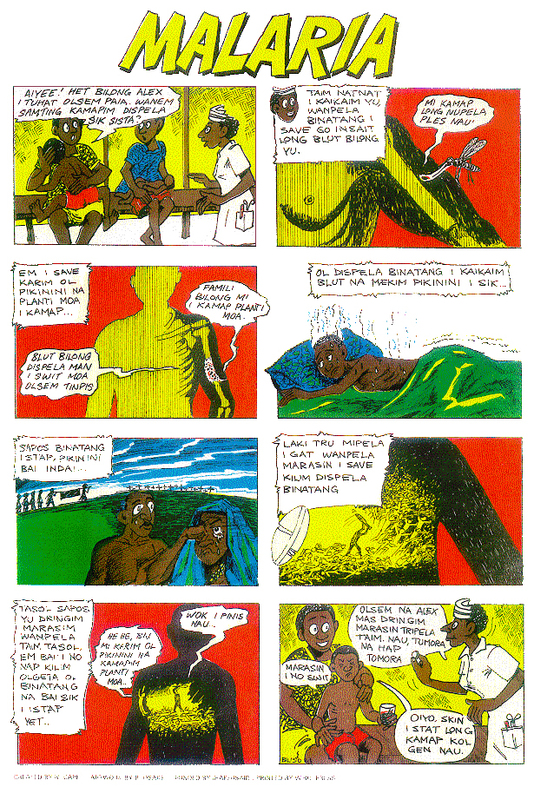 For a language sample, here is an informative comic strip on malaria. I’ve created what I believe to be the world’s first Tok Pisin speech synthesizer. Download sound files from the table below. Beware of a strong Swedish accent!! Mi laik painim ron bilong balus i kirap long Fraide. Hamas bilong baim tiket i go long Mosbi? I gat sampela sit i stap long dispela ron bilong balus? Raitim olgeta flait long Kavieng i go long Mosbi i gat stap long Manus na Madang. Wanem taim bai mi lusim dispela hap? In 1998, I whipped together (with a lot of help from my friends!) an automatic speech-to-speech translation system from Swedish to Tok Pisin. 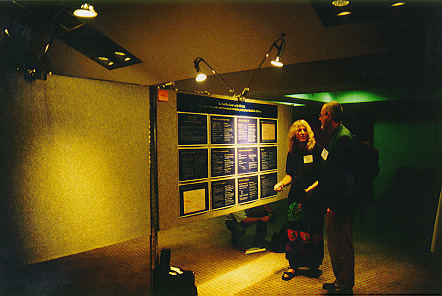 The paper was presented in poster form at the International Conference on Spoken Language Processing in Sydney, December 1998. Here are a couple of pictures from that event. “Ko Tok Ples Ensin bilong Tok Pisin” or the TP-CLE: A first report from a pilot speech-to-speech translation project from Swedish to Tok Pisin. Proceedings of ICSLP 98, Sydney, November 30 – December 5. Paper 804, Vol. 4, pp. 1131–1134. CD-ROM from Causal Productions Pty Ltd, PO Box 100, mailto:info@causal.on.net. Download a sample sound file from the table below. Visa flighter som går från Boston till San Francisco på tisdag. Here is a listing of literature on, or in, Tok Pisin. I have not included literature on pidgin/creole languages in general, even though they might include some information on Tok Pisin (a paragraph or chapter or so), but instead concentrated on works devoted mainly to Tok Pisin. I have not seen all the works with my own eyes, so I can’t vouch for the relevance of all the titles listed below, some of which are extremely hard to find, at least from my position in Sweden. I would like to thank the following people for the assistance: Eva Lindström, Peter Mühlhäusler, Mikael Parkvall, Malcolm Ross and Craig Volker. If you know about literature on, or in, Tok Pisin which is not found on this list, please send me an email at and I’ll add it forthwith. Click here for the full Tok Pisin Bibliography. Here are some links on Tok Pisin. Here is a good Tok Pisin link: Niugini.com. ... and here you can read Hail Mary in Tok Pisin. 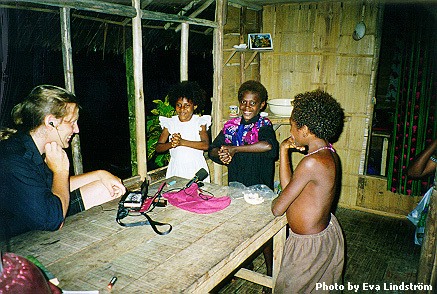 If you want to listen to Tok Pisin, you can always use the Radio Australia Tok Pisin Service. For a large number of good links, go to Kami Wantok's Forum. Here is a Pidgin–English Dictionary. Karl J. Franklin discusses some lexicographic considerations for Tok Pisin.